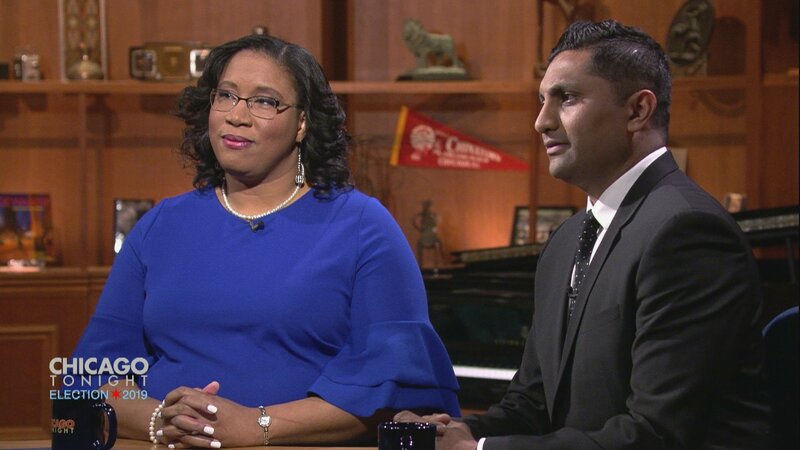 City treasurer candidates Melissa Conyears-Ervin and Ameya Pawar participate in a “Chicago Tonight” forum on March 18, 2019. Qualifications and public banks. Those were the repeated subjects that came up during the “Chicago Tonight” treasurer’s forum Monday with candidates Melissa Conyears-Ervin and Ameya Pawar. “I take credit in being the only candidate in the race with an MBA in finance and over a decade of experience in the private sector,” said Conyears-Ervin, a state representative whose 10th District covers parts of Garfield Park and the Near West Side. “My mother taught me that as an African-American woman, I had to work twice as hard as the next man,” she said. “I have a master’s in public administration, which is the equivalent of an MBA for the public sector,” said Pawar, alderman of Chicago’s 47th Ward on the North Side. Video: Watch the full forum. The office of city treasurer oversees and manages all money and investments for the city of Chicago, its four employee pension funds and the Chicago Teachers’ Pension Fund. Treasurer Kurt Summers currently fills the position. He decided not to seek re-election. During the forum, Pawar reinforced his support for a public bank in Chicago, which he first touted as one of his main agenda points last month ahead of the Feb. 26 election. “A public bank would function like a private bank, except this one would be controlled by taxpayers,” he said. “This one would be democratized so that we’re not just putting deposits in big banks who are then lending to private prisons who are financing immigration detention centers,” he said. As for the potential risk to taxpayers, Pawar said they should look at their current returns. “We’re paying millions of dollars in fees and interest to banks to … hedge fund managers. What are we getting? The status quo is not working,” he said. Conyears-Ervin said she would be open to considering “all topics” when it comes to implementing a public bank.